MIT's latest output device is a variation on the pushpin screen that you saw at your local science museum's gift shop. But way more cool. Now you have a computer controlled surface and what is really surprising is how much you can get from this simple idea. With the help of a 3D depth camera and some innovative software, the surface can act as an output device that lets you manipulate real objects remotely. If you use the surface as a table then your computer can bring you real objects such as your mobile phone. Of course, almost boring by comparison, there is also the application of showing the user models of 3D objects to help with the design process. Watch the video to see how it works in practice. What you can't see in the video is that the actuators can provide a variable stiffness modifying how the surface feels and how it can be moulded by touch. 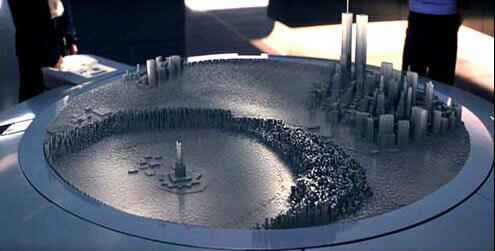 Although these pushpin devices (non-electronic ones) have been around for a while, sf fans fondly recall the cool table display from the X-Men move, which could instantly recapitulate any urban topography.